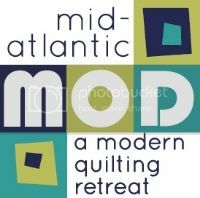 Philadelphia Modern Quilt Guild: Spotlight on... SUJATA! Hello folks! Hope you enjoyed all the fabric and quilt store bios and now we're back with member spotlights. Read on to learn more about Sujata. My name is Sujata Shah. Originally from India, I moved to the U.S in 1986 after finishing my degree in graphic design. I am mother of two young men and a teenage daughter, a quilt designer and teacher. I currently live in a suburb of Philadelphia with my loving husband and daughter. Growing up as a little girl, I was not very fond of sewing. I recall watching my mother sew her blouses, dresses for my sisters and I and all the utilitarian things like bags and pillow cases. She was good at sewing things without a pattern. I remember helping her all the time but I was sure I was never going to do the things she did! What do you do (employment or for fun)? I started working at a local quilt shop in 2002. I taught classes based on Kaffe Fassett quilts and fabrics and workshops inspired by quilts of Gee’s Bend, needle turn appliqué and ran block of the month appliqué club based on my original designs. Currently, I teach classes at Spool in Philadelphia and Quilter’s Corner in Chadds Ford. My blog is The Root Connection where I share my current work in progress and things that inspire me. In early 90’s we lived in California. In 1992, I took a class at a local store and learned all the techniques of basic quilting. It was my first experience of being able to create patterns with fabrics. Later that year, I started making soft sculptured dolls to sell at local craft stores. I also made dry and silk floral arrangements to sell during those years. I took a long break from quilting and crafting while raising two young boys. In 1996 we moved to Seattle. After moving, I made good use of those leftover fabrics from dolls and made my second quilt. That quilt got attention of a friend who was part of a neighborhood quilting group. She invited to join the group and I was hooked! What do you like best about quilting? In my opinion, the best thing about quilting is that it is always evolving. I see this art full of possibilities with timeless beauty. It does not matter if the quilt is traditional or contemporary; it warms the hearts of friends and family, young and old alike. Like any other art form, it is a medium that lets you express your true emotions with color style and patterns. I can remember all different phases of my life when I see each of the quilts I have made as if the memories have been preserved one stitch at a time. It is also a documentation of my being. I have evolved as a person and a designer and my quilts are here to tell my story! What is the hardest thing about quilting? 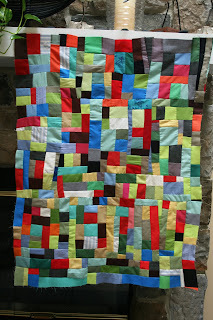 The hardest thing about quilting is having too many ideas in my mind and not having enough time to implement them all. How do you decide what pattern to make? Since I like making my own patterns, I have rarely started a quilt with a pattern and if I did, I always change it to my liking. I enjoy experimenting with patterns and colors. I honestly think that none of my quilts match the interior of my house. When I start working on a quilt, it usually begins from a memory of a place or colors of the season. I enjoy working on scrap quilts as they provide endless possibilities. I like using up bits and pieces of fabrics from my stash to create unusual combinations of textures and colors. Where do you do your work? Do you have a quilting room? I have an extra large room in my basement that is devoted to my quilting and designing. I have installed two design walls and there is always a project or two in works at the same time. Do you use a sewing machine, long arm quilter or do you quilt by hand? I have a viking mega quilter which I use for sewing and machine quilting. I can see myself really getting into various quilting designs if I ever got into longarm quilting. I enjoy hand quilting and taking my time as I stitch those stitches away. Maybe that’s why I have many quilt tops still needing my attention! Do you name your quilts or label them? I would love to get into habit of labeling the quilts. I have always named my quilts because they are usually inspired by some memory or an event. How do you choose your colors? What are your favorites? I have never excluded a color from my stash but I would say that purple is my list favorite of all. I think green would be my favorite color. I like using high contrast in colors, textures and scale of the print. What quilt(s) are you working on now? I am inspired by the quilts of Gee’s Bend and quilts made by Anna Williams. Indian Ralli quilts are my other source of inspirations. I want my quilts to tell a personal story. What other crafts do you indulge in or hope to learn? Along with quilting I truly enjoy gardening, yoga and taking long. I would love to try mosaic some day and paint furniture. After finishing graphic design, I have not picked up a paint brush in my hands. It would be nice to go back to painting too! What are your quilting related goals? As far as my quilting related goals, I would very much like to publish my appliqué patterns some day. I would also like to teach more classes in the area shops. I enjoy spending time with other quilters who inspire me with their love and devotion to the art of quilting. I hope to do the same for beginning and experienced quilters. Oh yes, and to quilt those 40+ quilt tops that are sitting in the closet! My most treasured possessions are my hands and my eyes! We all know I can’t get anything done without them! My motto is to keep it interesting. Surprises are good and variety is the spice of life! Thanks Sujata, for taking the time to answer all my questions and to send me your photos. The photos are spectacular! The spotlight will be back in two weeks - see you then! Beautiful work, Sujata. I love the freedom and joy in your designs. And what a diversity of expression! Thanks! You and your work are such an inspiration. I love your sense of color play! Brava! Thank you so much for giving me the opportunity to share my quilting journey. It is always fun to share the love and enthusiasm for quilting with other creative minds. Wow, Sujata, gorgeous quilts! I especially love the black, gray, and red house quilt, and the silky-looking one. And do you really have 40 tops that need finishing? I would love to see them all! Your work is fabulous! Isn't that awful? Yes, I do have that many quilt tops. Better get going with that machine! What a great interview!! Such amazing, exciting, inspiring quilts!! and so many!! I love the big colourful wheel quilt, but I also love that you do traditional applique as well, and Amish style quilts. Stunning work! And you are fearless with color, I am envious of that skill. Sujata - I love your color bravery - it has given you amazing results. Your work is beautiful and refreshing - more please! Wow! I love your interview and really love your work - beautiful! Introducing Susan of the Village Quilter!